Bathsheba Culpepper to marry Josiah Whitley, Bond Date: 30 Sep 1829 in Nash Co., NC, Record No. 01135, Bondsman: Willie Griffin, Witness: Benja H Blount, Bond No. 000087085. William P Culpepper, Roomer, M, 73, S, AL/AL/AL, Grinder, General, Vet=No. has 27 Oct 1948, age 94. Florence DENEENE, Other, F, S, W, 15, MI/IRE/IRE. Elizabeth Culpepper, Inmate, Wh, F, (Mo?) 1861, 39, IA/UN/UN. Elizabeth Culpepper, Inmate, F, Wh, Age Unk, UN/UN/UN, Idiot. Elizabeth Culpepper, Inmate, F, Wh, 59, Marital Status & Birth States Unknown. Year: 1880; Census Place: Grand Chain, Pulaski, Illinois; Roll: 244; Family History Film: 1254244; Page: 241A; Enumeration District: 091; Image: 0043. Photographed Jan 1984� He was photographed in Jan 1984 at age 76. Biography* � EAST PEORIA - The Rev. Joseph T. Emanuel, 93, of 500 Centennial Drive died at 3:50 p.m. Monday, Dec. 25, 2000, at his residence. Born Oct. 15, 1907, in Weatherford, Texas, to Thomas and Sarah Jane Sampley Emanuel, he married Fay Zoe Culpepper on Jan. 6, 1934, in Weatherford, Texas. She survives. Also surviving are one son, Joseph Jr. (and Barbara) of Peoria; three grandchildren; and one twin brother, James (and Odessa) of Azle, Texas. He was a graduate of Weatherford Junior College, Southwestern University in Georgetown, Texas, and Perkins School of Theology at Southern Methodist University. He was awarded an honorary doctrine of divinity degree from McMurry College in Abilene, Texas. He was a retired United Methodist minister, having joined the New Mexico Conference of the United Methodist Church in 1933. In his more than 60 years as a minister, he served churches in Colorado, Texas and New Mexico. Following his retirement in 1974, he served as minister of visitation for Grace United Methodist Church in Alamogordo, N.M., for more than 20 years. He was a member of the New Mexico Conference of the United Methodist Church. Peoria, where visitation will be one hour before. Rev. Sigurd Bjorklund will officiate. Burial will be in Swan Lake Memory Gardens. Cumerford-Endsley-Diggle Funeral Home is in charge of arrangements. Memorials may be made to Emanuel Scholarship, c/o Grace United Methodist Church, 1206 Greenwood, Alamogordo, NM 88310. 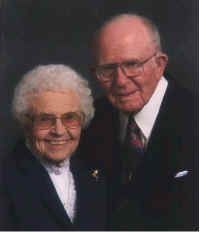 Clara Culpepper (Clark) Johnston, 93, of Clovis, N.M., died Wednesday, April 18, 2007. One of 12 children, of John and Fairy Culpepper, Clara was born Feb. 11, 1914, in Silverton, Texas. She grew up in Grady, N.M. where she attended school. In 1932, she married Dallas Clark. They had one daughter, Beverley, born in 1939. They settled in Portales and both, Dallas and Clara worked at the local newspaper as Linotype operators. Moving throughout the state of New Mexico they assisted in the start up of newspapers in Lovington and Farmington, eventually settling in Carlsbad where they resided until Dallas' death in 1968. Clara spent the next several years living with her daughter and family in Glenview, Ill. and Nashville, Tenn. But, she was a "small town girl", so eventually she moved back to Clovis. She worked for the Clovis school system, retiring in 1980. Clara met and married Noel Johnston, in 1983. She and Noel were very active in their church, First Church of the Nazarene, and they loved to travel. Noel passed away in 1994, and Clara continued to live in Clovis until her death. Clara is survived by a loving family which includes one daughter, Beverley Hayes (Percy), of Granbury, Texas; three grandsons, Randall Hayes (Cherylea), of Richmond, Texas, Terrell Hayes (Cathy), of Charlotte, N.C. and Dallas Hayes (Brenda), of Plano, Texas; one granddaughter, Renata Sobey (Martin), of Mount Prospect, Ill; 10 great-grandchildren; one step-daughter, Diane James (Ken), of Clovis, N.M; and several step-grandchildren; two brothers, Noel Culpepper, of Murfreesboro, Tenn. and Travis Culpepper of Slaton, Texas; and two sisters, Edna Thompson, of Rio Rancho, N.M. and Teretha Chisum, of Loomis, Calif; and several nieces and nephews. She was preceded in death by her parents; husbands, Dallas Clark, in 1968 and Noel Johnston, in 1994; brothers, Alvin, Wayne, Curtis and Rayford; and sisters, Ola, Faye and Cletus. Clara dearly loved her family. Her most treasured moments were spent with family and friends. She loved having visitors and she was a generous and gracious hostess. She was a wonderful cook and she always made you feel special by making your favorite dish. Going to "Aunt Clara's" to eat was a special treat! Clara was always very active and she loved to go places and do things. But for many years, her spirit has been confined and frustrated by a body no longer able to do the things she enjoyed. Now she is free and her spirit can soar! Even though our hearts are heavy now, we rejoice with her as we celebrate her life. We take joy in remembering all the wonderful times we shared with her. She was a special lady and she has a special place in the hearts of those whose lives she touched. Services will be at 10:00 a.m. Monday, April 23, 2007, at First Church of the Nazarene, with Rev. Darwin Speicher officiating. Burial will follow at Mission Garden of Memories. E-mail written Apr 2007 to Warren Culpepper from Randy Hayes, Phone 832-668-1440, e-mail address. J A Culpepper is the father of an infant born 3 Nov 1915 in Briscoe Co., Texas. Rayford "Ray" Culpepper went home to be with the Lord on Wednesday, March 2, 2005. Celebration of life: 11 a.m. Saturday at Ridglea United Methodist Church. Burial: Greenwood Memorial Park. Visitation: The family will receive visitors 6 to 8 p.m. Friday at Baumgardner Funeral Home, Fort Worth. Born May 15, 1920, in Grady, N.M., Rayford was one of 13 children born to John and Fairy Culpepper. Ray lived an exemplary life and was honored by his church, loved by his family and friends, and will be missed by all who knew him. Ray served in the United States Army from August 1944 to January 1946. What a great husband, brother, daddy, granddaddy and great-granddaddy he was. A husband who loved and cared for Alma for 66 years. A brother to six brothers and six sisters. They all knew the Lord and many were waiting to welcome him into heaven. A daddy who provided for, cared for and loved four sons and one daughter. A granddaddy who loved to play ball and was always ready to help someone learn to ride a bike. Ray saw all of his grandkids graduate from high school and loved all of their children as much as he loved his own. The great-grandchildren loved getting hugs from "Paw Paw." The family wishes to express tremendous gratitude to all of the wonderful care-givers at Harris Methodist Southwest. Ray had been a member of Ridglea United Methodist Church since 1947. He served as head usher at the church for 37 years and also served as Sunday school superintendent for several years. Ray loved his church and demonstrated God's love and his love through his actions. Survivors: His loving wife, Alma; sons, Donald, Stanley and wife, Patty, Gary and wife, Carol, and Gene and wife, Jan; devoted daughter, Julie; grandchildren, Russell and wife, Lori, Michelle Shepherd and husband, Troy, Chris and wife, Angela, Alan and wife, Shayne, Doug and wife, Janet, Michael and wife, Erin, and Stephen. Ray is also survived by Janice Culpepper; 12 great-grandchildren; sisters, Clara Johnston, Edna Thompson and Teretha Chisum; brothers, Noel and Travis; and many nieces and nephews. Obituary of Alma Mae Capps Culpepper, #36023, published 22 Jan 2007. Rayford Culpepper, White, Married, born 1920 in New Mexico, residing in Roosevelt Co., New Mexico, enlisted as a Private in the US Army on 15 Aug 1944 in Sante Fe, New Mexico. Obituary* 22 Jan 2007� Alma Culpepper, 86, went home to be with the Lord and to be reunited with her beloved Ray on Saturday, Jan. 20, 2007. Alma Mae Capps was born Nov. 28, 1920, in Allen, Okla., one of four daughters. She married Rayford "Ray" Culpepper on May 15, 1939. He remained the love of her life. Alma graduated from Texas Christian University with a degree in elementary education at the age of 50 and retired from the Fort Worth Independent School District after 20 years of teaching kindergarten. How she loved to reminisce about her students. Her years of teaching remained very special to her until the end of her life. Alma had been a member of Ridglea United Methodist Church since 1947, where she was active in her Sunday school class and the United Methodist Women. Alma was a great cook and everyone enjoyed the dishes she brought to any get-together. Besides her church, Alma's passion was her family, especially the bond she shared with her devoted daughter, Julie. She loved spending time with her children, grandchildren and great-grandchildren and will always be remembered for her quick wit and sense of humor. The family wishes to express tremendous gratitude to all of the wonderful caregivers at Broadway Plaza. Survivors: Sons, Donald, Stanley and wife, Patty, Gary and wife, Carol and Gene and wife, Jan; daughter, Julie; grandchildren, Russell and wife, Lori, Michelle Shepherd and husband, Troy, Chris and wife, Angela, Alan and wife, Shayne, Doug and wife, Janet, Michael and wife, Erin and Stephen and wife, Rose Marie; and 13 great-grandchildren. Published in The Lubbock Avalanche-Journal on Feb.7,2014.